Fitz Hugh Lane, "Boston Harbor"
Fitz Hugh Lane, 1804-65, was one of America’s famous artists in art history. Categorized a luminist he placed emphasis in his later paintings on light, light effects. In a combined fusion of water, air and land, Lane created an all encompassing idealistic landscape atmosphere. Luminism, was an outgrowth of the Hudson River School of thought putting an emphasis on foreground planes of land and water moving away from the inner wilderness of the woods with its streams, hills and waterfalls. Primarily a self taught artist, Fitz Hugh Lane painted one of his early famous paintings, a watercolor, The Burning of the Packet Ship “Boston”, in 1830, a primitive work recording the event not having been there himself. Confined to a wheelchair and unable to venture into Nature (the woods) as other artists who followed the artistic trends of the Hudson River School, Lane began painting harbor scenes in the area around Gloucester, Massachusetts. Moving away from primitivism Lane’s brushstrokes became smoother in transition from one hue to the next creating an atmospheric environment missing in earlier works. 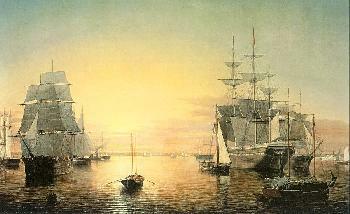 As Lane developed, he began pasting his sketches together into panoramic views of an entire area, sometimes later selecting individual sketches out of the panoramas and executing them as singular paintings, evidenced in a pencil watercolor rendering “Gloucester from the Outer Harbor”, in 1862. Possibly this is the reason for the one third-two thirds, low level, unbounded compositional arrangements in many of his works. Stringing the sketches together in a panorama was like that of a camera. The more landscape one wants in a picture the farther one has to recede away from the subject matter to record it all. The unbounded quality in Lanes artwork came from selecting parts of the large panorama to become paintings. The extent to which Fitz Hugh Lane’s paintings were a true representation of reality (in particular his use of atmospheric light) seemed to be subordinate to an inner vision of emotion or the spirituality trend of God in Nature that was wide spread at the time. Other famous American artists of the nineteenth century in art history were Asher Durand, Martin Johnson Heade, and John Kensett.